Zen: Horizontal icons along the bottom of the home screen (sometimes called a Bottom Dock Zen),or vertical icons down the left side of the screen (sometimes called a Side Dock Zen). Typically 4 or 5 icons, depending on the size of the icons and variations in themes. Good for keeping a clean look, and can be expanded to show more icons with one button. Icon: Full home screen of icons. 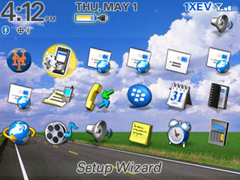 This format typically features 6 icons across multiple rows on the screen. Good for easy access to all of your applications. Today Theme: A combination theme that typically shows a few icons, as well as messages, emails and phone log (items may vary depending on the theme). 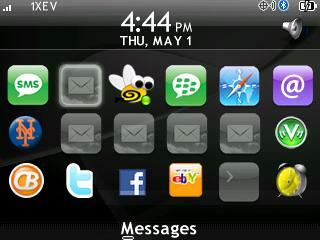 The new Pearls and CDMA Curves also feature the "L" theme (icons down the left side as well and the bottom). 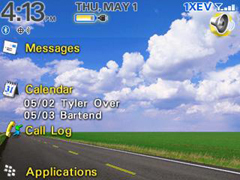 When available, devices that do not ship with the L theme but are updated to OS version 4.5 will feature this theme. BlackBerry Smartphones featuring OS 4.6 (the BlackBerry Bold and Kickstart) will also feature all-new Precision themes, which feature transparency effects. 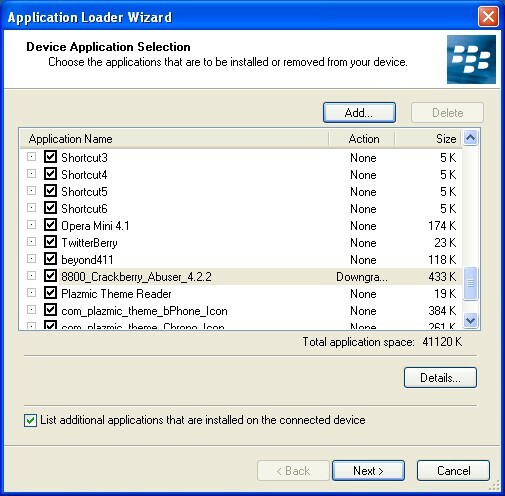 One of the ways to get new themes is to unlock all the vendor themes that are packaged in the BlackBerry software. 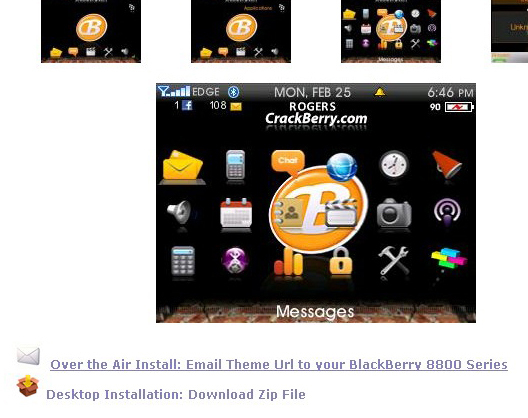 Disclaimer: CrackBerry.com takes no responsibility if you attempt this and nuke your device. This is not a difficult process if you follow the steps. 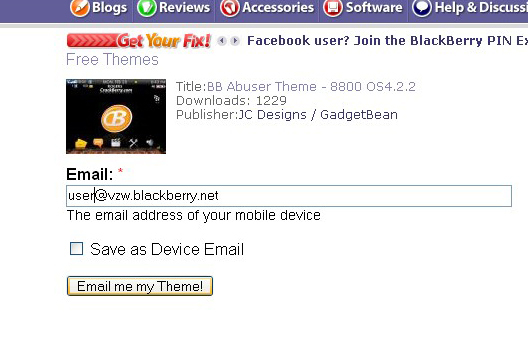 You will need to edit your blackberry.alx file to unlock these themes. This is the theme file, you'll need to edit it and take out the vendorID. It should look like this when done. You can do this for all the theme files and hence have all vendor themes unlocked for your use. Then save the file. Close all the open files and open the Desktop Manager, connect your device, and it should automatically ask if you want to upgrade. Click yes and you should be good to go. 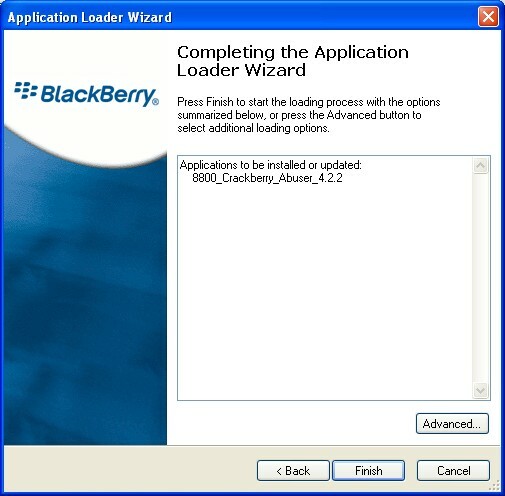 If it doesn't, you can open the App Loader and do it manually. Make sure you do a battery pull after this process (if the device doesn't automatically reset). Now if you are using an OS other than one provided from your carrier, you'll also need to delete the Vendor.XML file which can be found in the same location as the BlackBerry.alx file. 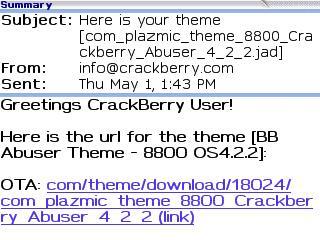 If you have questions or need help, please visit the Unlock All Vendor Themes thread in the CrackBerry Forums. To be sure you don't nuke your device when installing themes, we need to verify the device and operating system. To do this, enter the Options menu and select About. 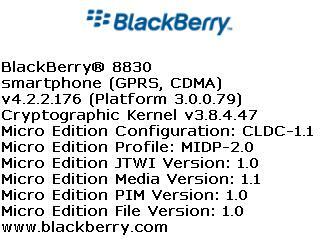 Here you will see your device listed – in my case BlackBerry 8830. Below is your operating system – v.4.2.2.176. These are important when downloading themes in order to insure compatibility. There are many great resources available for downloading themes. 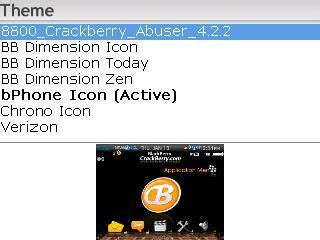 A good place to start is the Crackberry.com Free Theme Gallery. There are multiple themes in various styles for all devices and the gallery will grow with time. If you are looking for premium themes that pay attention to detail and are backed with support by the developer, there is a great selection in the ShopCrackberry.com Store as well. In most cases you will have the option to either download the theme to your desktop and install with the Desktop Manager, or download through and Over The Air (OTA) link. To download the theme to your desktop, save the file (usually a .zip file) and unzip it to your desktop. Run the Desktop Manager and select add. You will see the .alx file for your theme, select it and then continue. You will see the Applications To Be Added screen. Select finish and you're done. To send a theme to your device OTA, most sites will let you email yourself a link by simply entering the address of your device. Be sure to have a data plan associated with your BlackBerry if you go this route as the download will use data. When you receive the email, you may click on the link and the download will open and you will be prompted to install the theme. If the situation arises where the download link in the email is not clickable, you can highlight the url, copy it to the clipboard, open your web browser and paste the url into the address field. This accomplishes the same thing as clicking the link within the email. When the download is complete, the theme will be fully installed and ready to go. 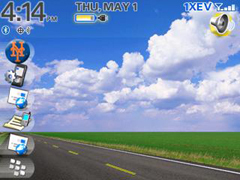 Providing you installed the theme correctly, to use it is simple. Navigate to Options and then Themes. Scroll to the theme you wish to use and click the trackball. It may take a few seconds to load, but then you're done! If the new theme doesn't appear quite right (ie. an icon is missing), you may want to reboot your device. After installing a new theme, this can be beneficial. Most themes allow you to arrange the icons as you desire (most Icon themes and some Zen themes). To do this, highlight the icon when on the icon screen (all application icons are shown), click the menu button and select Move. Then you can place the icon where you desire. If there are icons that you feel you will not use, you can also Hide the icons from your home screen by selecting Hide. To view hidden icons, select Show All. Some Zen themes will not allow you to move icons as they are docked. This is just default to specific themes and unfortunately there is no way around it. If you aren't happy with the background image provided with you theme, you can change it easily. Follow our How To Change Your BlackBerry's Wallpaper guide to learn how. The one thing to be sure of when using themes is that they are compatible with your device. The last thing you want to do is download a theme designed for a different device or OS and nuke your precious Berry. If this happens you aren't totally out of luck. You can repair a nuked device by following our tutorial on How To Reload The Operating System On A Nuked Berry. Removing themes is just as easy as installing. 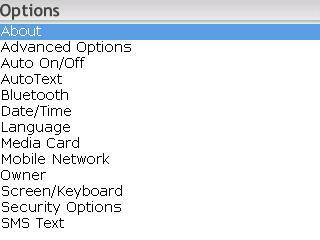 The simplet way is by going to the Advanced Options menu (Options > Advanced Options > Applications). 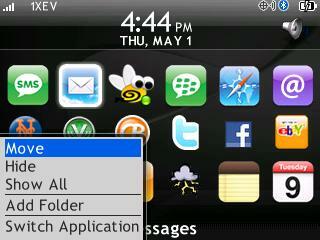 Here you will find a list of all the applications currently installed on your device, including themes. To remove a theme, highlight it and select Options > Delete. Note: Some themes may have odd names such as com_plazmic_theme-name so it's best to vie the properties of the item to insure it is the correct theme. You may also remove a theme through the Desktop Manager in the same fashion as installing by removing the checkbox located next to the theme name. 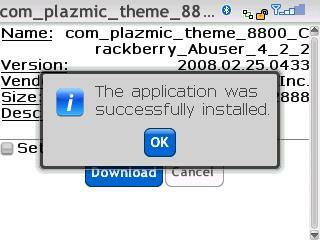 Currently Plazmic CDK allows users to create Zen, Icon and Today themes. The program has some limitations ie. not being able to create L themes. The next release of the Plazmic CDK should allow for greatly enhanced Theme Design capabilities, including more styles (L, Bottom Dock, Hybrids) and allow for animations. Hopefully this BlackBerry 101 has answered *most* of your BlackBerry theme questions. If not, be sure to visit the Themes Forum and post your questions there. 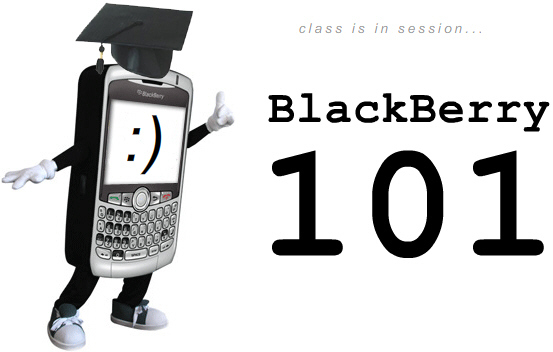 A knowledgable member of the CrackBerry.com community should be able to help you out!